Our understanding of the pathogenesis of immune-mediated idiosyncratic reactions (IM-IDR) remains incomplete. There have been several recent reviews that address the possible mechanisms of IM-IDR and the reader is referred to these for detailed discussions (Park et al. 2001; Pirmohamed et al. 2002; Uetrecht 2003; Uetrecht 1999; Williams and Park 2003). Figure 1 presents the general paradigm that will be used to address the pathogenesis and prediction of idiosyncratic reactions. The initial hypothesis of an immunological basis for idiosyncratic reactions came from the clinical presentation: delayed onset, fever, and the common occurrence of systemic eosinophilia. Histopathological evaluation of idiosyncratic hepatopathies often reveals infiltrating lymphocytes and plasma cells as well as bridging necrosis reminiscent of viral hepatitis. A skin rash is often part of the clinical presentation and histopathological examination reveals lesions consistent with immune-mediated skin disease. Serum sickness-like reactions, including polyarthritis, have also been reported. On re-exposure, there is often, although not always, a shorter period of time to recurrence of clinical signs. This general clinical picture was consistent with an immunological basis, particularly for the systemic hypersensitivity syndrome reactions associated with drugs such as the sulfonamides and aromatic anticonvulsants (Cribb et al. 1996; Shear and Spielberg 1988). Over the last 25 years, a plethora of studies have identified immunological responses in patients experiencing idiosyncratic reactions to drugs (Table 3). In addition to antibodies against the drug or drug-conjugated proteins, antibodies against native cellular and nuclear proteins have been identified. The reader is referred to previous excellent reviews (Pirmohamed et al. 2002; Uetrecht 1999). The key conclusions are: 1) there is very strong evidence for activation of the immune response during idiosyncratic reactions; 2) the immune response to a drug can be quite varied, with both antibody and cell-mediated responses being documented; and 3) the nature of the immune response plays a significant role in determining the clinical presentation. Table 3. Examples of immunological responses identified in human patients with idiosyncratic adverse drug reactions. Various types of immunological responses have been identified in subjects experiencing idiosyncratic reactions. Examples of responses that have been identified in multiple patients or by several authors are shown. *Demonstration of antibody directed cell cytotoxicity in in vitro systems, but lymphocyte transformation tests have not been positive. Further evidence for an immune response in IDR comes from immunogenetic studies of susceptibility to or severity of idiosyncratic reactions. Specific human major histocompatibility complex (HLA) haplotypes (Andrade et al. 2004; Dettling et al. 2001; Martin et al. 2004; Roujeau et al. 1987) and polymorphisms in cytokine or heat shock genes (Aithal et al. 2004; Corzo et al. 1995; Martin et al. 2004; Pirmohamed et al. 2001; Yunis et al. 1992) have been identified that influence susceptibility or severity to a variety of idiosyncratic toxins. The association is most striking with abacavir (approximately 95% of patients have the at risk genotypes compared to 1% in the control population), however in the majority of cases the association is relatively weak (Mallal et al. 2002; Martin et al. 2004). Unfortunately, the specific HLA haplotypes or other markers that appear to confer susceptibility are quite variable and appear to be drug specific. Thus, a specific susceptibility genotype that can be used to identify an "at risk" drug-related immunogen characteristic appears unlikely to be consistent across chemically divergent compounds. Nevertheless, the contribution of immuno-genetics to individual susceptibility or severity further supports a role for the immune response. If we accept that an immune response is an important and, in most cases, a required part of the clinical reaction, then we can appreciate that understanding the properties that contribute to a drug acting as an immunogen is necessary to enable us to "dial out" those properties during optimization. It is generally believed that most drug molecules are too small themselves to induce an immune response. The most common underlying hypothesis to explain how a drug can become immunogenic is the hapten hypothesis (Park et al. 1987). This hypothesis states that drugs must be covalently bound to a macromolecule carrier (usually a protein) to act as an immunogen. This macromolecule is then processed by the immune system such that a new peptide fragment or a peptide fragment containing the covalently bound drug is presented to the immune system and induces an immune response. This raises the question then as to when or how does covalent binding of a drug result in recognition by the immune system and an attendant response. The original hapten hypothesis is based on the traditional self/non-self recognition paradigm: when a drug is covalently bound to a macromolecule, it creates a modified macromolecule that is now recognized by the immune system as non-self, triggering a response. If the peptide fragment presented to the immune system contains the drug, a response directed against the drug or a drug-peptide epitope may be induced. Alternatively, the immune response may be directed against a novel epitope that results from changes in protein confirmation or processing. An alternative explanation, called the danger hypothesis, has been proposed by Matzinger to explain why an immune response occurs against immunogens in some patients and not in others (Matzinger 2002). She has postulated that foreignness alone is insufficient to alone trigger an immune response and that context is more important. 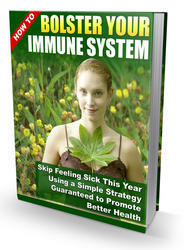 An immune response will only occur if a second "danger" signal is presented. Potential danger signals include heat shock proteins or cytokines that may be elevated as a result of cell toxicity or concurrent disease causing cell damage (e.g. viral infections). If true, this may help to explain part of individual susceptibility to idiosyncratic reactions, from either a compound perspective (compounds associated with higher cytototoxicity) or a patient perspective (increased incidence of idiosyncratic reactions in HIV-patients). The reader is referred to recent reviews (Pirmohamed et al. 2002; Uetrecht 1999). A third possibility that does not depend on haptenization by the drug or drug metabolites has been proposed. Picher et al. have demonstrated that sensitized lymphocytes can recognize drug molecules non-covalently linked to protein, in an MHC-restricted manner and that, at least in vitro, free drug can induce lymphocyte activation in some individuals (Engler et al. 2004; Schnyder et al. 2000). Whether this "pharmacological induction" occurs in vivo or induces a sufficiently strong immune response to cause a clinical reaction is unknown. 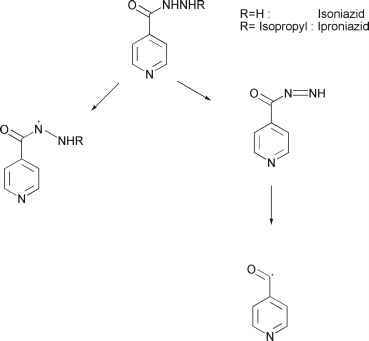 At the moment, the support for this mechanism is not sufficiently strong to use as a basis for lead optimization. Figure 2. A general scheme for the immunopathogenesis of immune-mediated idiosyncratic reactions. The primary difference between the traditional hapten hypothesis and the danger hypothesis is in the nature of stimulation required to trigger an immune response. 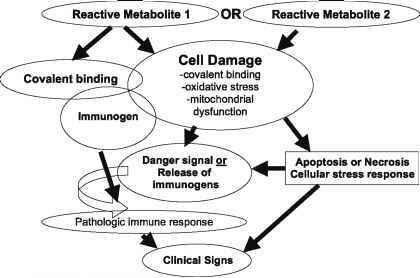 In both cases, bioactivation to a reactive intermediate and subsequent covalent binding to cellular macromolecules, as well as cell damage or stress, are considered an important and necessary step in the pathogenesis. processed, they must be taken up or found within antigen presenting cells (APC). One possible mechanism by which modified intracellular proteins can be taken up by an APC is cell damage and death that leads to the release of proteins or engulfment of damaged and dying cells by APC. If protein conjugates are formed in cells that are capable of MHC class I presentation, then intracellular formation of a neo-antigen may lead to processing and presentation for a cell-mediated response. Possible reasons why some individuals may experience a reaction, and others not, include immunogenetic variation, haptenic density, previous sensiti-zation by immunologically-related epitopes, and degree of cell death (and subsequent release of immunogens). For the purposes of lead optimization, these two competing hypotheses may be considered as equivalent. Once an immune response has occurred, how does the immune system access an intracellular protein? It has now been shown for the majority of proteins identified as immunopathological targets that they are also expressed on the cell surface and that this expression can often be up-regulated. Cell-surface expression presumably allows the immune system to recognize and target cells expressing the antigens. Table 4. Examples of protein targets identified in immune-mediated idiosyncratic reactions. testing appears highly effective (Mallal et al. 2002), while for many other drugs skin testing is either unreliable or does not produce a positive response. For some drugs, anti-drug antibodies are specific to hypersensitive patients, but for others, anti-drug antibodies have been found in both patients and non-hypersensitive controls (Aithal et al. 2004; Clarke et al. 1991; Hastings et al. 1995). Further, the clinical reaction may continue after the drug is theoretically cleared from the body (Bedard et al. 2000), suggesting that the drug-associated antibodies are not the primary cause of the immunopathologic reaction. Animal models exist in which antibodies or an immune response directed against the drug can be induced without associated pathology (Clarke et al. 1990; Furst et al. 1997; Hastings et al. 1995). These observations suggest that, with the exception of IgE-mediated drug allergies, antibodies directed against the drug are more a marker for an immune response than an executioner for the clinical disease. Antibodies directed against neo-antigens are not associated with pathology unless the drug is also present, suggesting that a drug-induced conformational change is required, that the drug alters the expression or distribution of the protein such that it becomes accessible to the drug, or that the drug must be present to induce a danger signal. In vitro studies have shown that antibodies recognizing drug-protein conjugates can mediate antibody-directed cell cytotoxicity in vitro and that cytotoxic T cells directed against drug-associated epitopes can lead to cell death (Kretz-Rommel and Boelsterli 1995; Mieli-Vergani et al. 1980; Neuberger and Williams 1989; Vergani et al. 1980). These studies suggest that cell-mediated immune responses play an important role in the associated pathology. Our current knowledge of idiosyncratic reactions, then, supports the concept that drug-induced immune responses are involved in the pathogenesis of idiosyn cratic reactions. Formation of covalent drug-protein conjugates following bioacti-vation (reactive intermediate formation) is likely a required step in the pathogenesis of IDR. Immune-mediated cytotoxicity is a required end-point for pathology, but early chemical cytotoxicity may play an important role in triggering the immune response. These three characteristics (bioactivation, covalent binding, and cytotoxicity) may then be used in a lead optimization paradigm.